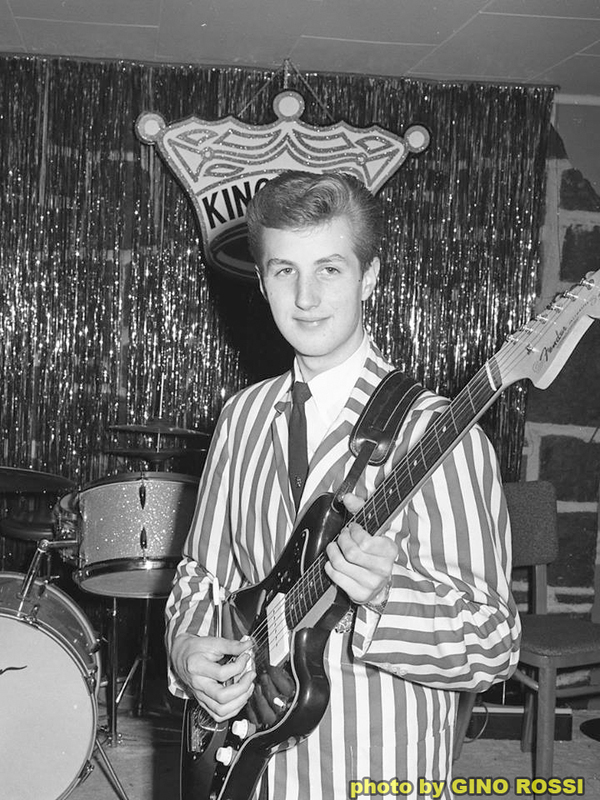 Jack was a member of the Kingsmen, but he left the band not long after recording the song, and never had the opportunity to rejoin the band after it became a hit record. Jack was one of the two main reasons I embarked on this LOUIE LOUIE quest – the documentary project and the subsequent website you’re reading right now. The other main reason was Richard Berry, the original songwriter. I met both of these guys at the KFJC Maximum LOUIE LOUIE Marathon many years ago. Richard was the one that composed the song, which he sold to pay for his wedding in 1957. When Richard arrived at this event, he was struggling, surviving on welfare benefits and taking data entry courses to boost his marketable skills, as his musical career just wasn’t paying the bills at the time. When Jack Ely found out about this LOUIE LOUIE marathon, he was able to find a last-minute airline flight from Oregon to California, and attend this very special event. 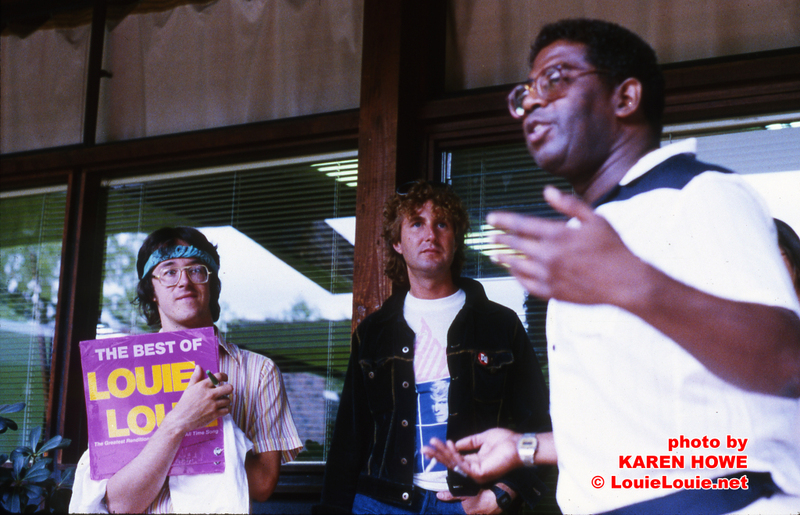 This marked the very first time these guys had ever met each other, and some serious musical history was made in August 1983. I was the only one with a video camera when this special moment happened and, as I heard their stories, I thought how all of this had potential for a great documentary … even though I had never produced a documentary before. In the years that passed, I continued to explore the big story, interviewing literally hundreds of people, including all of the original members of the Kingsmen, various associates of Richard Berry, lots of the musicians of the Pacific Northwest community that transformed the rhythm ‘n’ blues ditty into the now-iconic garage rock anthem, including members of the Fabulous Wailers, Little Bill & the Blue Notes, the Playboys (FIRST band to ever perform the song after Richard), Paul Revere & the Raiders, the Dave Lewis Group, the Frantics, the Sonics, and so many others. I also had some success in uncovering the official documents on the infamous F.B.I. investigation of the song, and in creating this webpage which first appeared in cyberspace back in 1997. Anyways, it’s been quite a journey, and I’m grateful Jack allowed me to document this grand story of his connection to this special song. I’m very happy to see so many obituaries about my friend Jack. It’s very gratifying to see so many articles acknowledging his role with this iconic rock and roll musical phenomenon. As I look at the various articles about Jack, I see a handful of common mistakes. A 455-page report by the F.B.I.? Did they re-release this thing with 2-3 times as many more pages? Where is this extended version? I got my 120+ page version directly from FBI after I wrote the letter in 1984, and haven’t heard about any new versions since then. I was surprised that articles mentioning his next of kin failed to mention Wendy Ely, who was married to Jack for 16 years, 1 month and 1 day. This was the longest marriage for Jack, and she was with him until the very end. 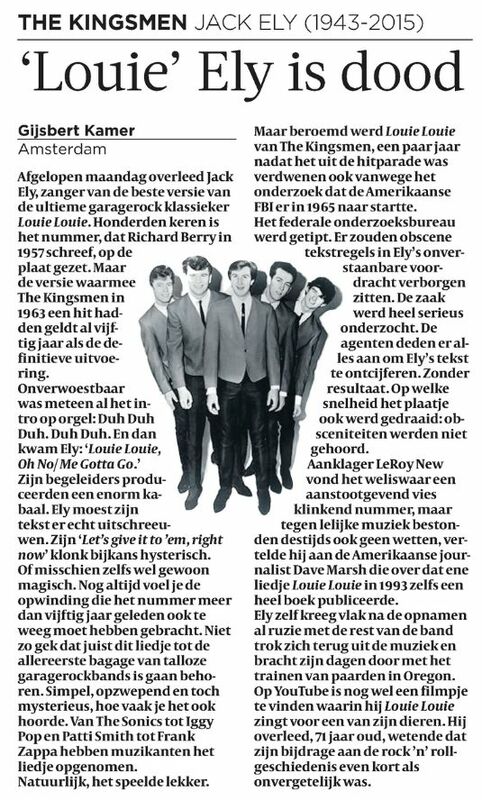 The biggest mistake was all the various photos of the Kingsmen without Jack Ely. A couple of them actually tagged Lynn Easton in the photos as “Jack Ely.” I know there’s not nearly as many photos of the original Kingsmen with Jack as there are of the Kingsmen circa 1964 and beyond, but it still seems extremely sloppy that these organizations failed to find a proper photo with Jack, especially considering how easy it is to find such things via simple internet searches in 2015. So here’s what i’m going to do. 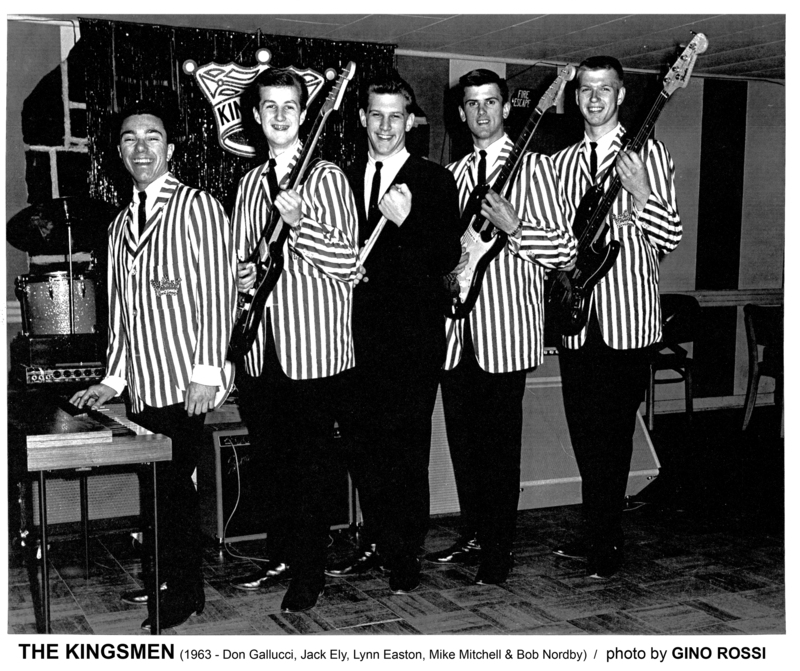 I’ll share a proper photo of the Kingsmen with Jack Ely, circa 1963, close to the time they recorded the song. The photo is by Gino Rossi. He really should be properly credited whenever this photo of the band is used. If you’re a prominent news organization that wants to use this, you really should compensate him, as opposed to sending money to a stock photo company for an image that doesn’t even feature Jack Ely. It’s the right thing to do. Please visit Gino’s Facebook page for more information about any proper licensing arrangements. Did you see that photo of Jack at the top of the page? That’s another one by Gino, with which he shared these thoughts on Jack…. I will remember Jack Ely from that first day at the Chase and for those first words of Louis Louie. The Kingsmen’s version of “Louie Louie” was a staple for all bands in the 60’s. We did a few shows early on with the Kingsmen. After he joined the Army he was stationed at Fort Ord and came to a few of our shows we did in in the area. He always liked how we did “Louie Louie” and sat in with us. Good Bye old friend…..
Jack’s son Sean Ely shared some heartfelt memories about his father when he was interviewed by KOIN 6 (CBS Portland). Here are some of the video clips I shot with Jack …. Here’s Jack with one of his beloved horses. I asked him to sing LOUIE LOUIE with his horse, and he humored me! Bless his beautiful heart!! Lastly I’d like to mention the Jack Ely Memorial Fund campaign set up by his family. If you can donate to pay for expenses, that would be wonderful. I’m really going to miss you, my friend.